Poster presentations at the Western Synthetic Biology Symposium 3.0. Image courtesy of Dr. Kathleen Hill. The third annual Western Synthetic Biology Symposium was the largest yet, with over 150 attendees, 30 posters, and oral presentations throughout the day. Although focused on synbio research happening in southwestern Ontario, there were speakers from both industry and academia from across Ontario and Quebec. Dr. Cintia Coelho traveled the furthest, all the way from the University of Braslia, to present her work on using integrases for genome engineering, and highlighting the truly international scope of synbio research. The day was kicked off by industry talks, where representatives from Ontario companies Specific Biologics, Designer Microbes Inc., and Ardra Bio discussed their exciting technology and spoke enthusiastically about their collaborations with Canadian universities. The US company SGI-DNA also showcased their new BioXp 3200 “DNA printer”, which automatically constructs custom DNA fragments as large as 1.8kb. Western University recently acquired one of these machines, which costs up to $65K/year to maintain. But, Dr. Karas (Western University/Designer Microbes Inc.) was quick to point out that by splitting costs between labs, access to this machine is relatively affordable. In addition, synthesizing DNA directly enables the design of complex DNA libraries, saving time and money versus traditional molecular biology techniques. Next, Dr. Jordan Thomson from Ontario Genomics hosted a panel discussion on the “Present and Future State of SynBio in Canada”. This discussion built on the Canada Synthetic Biology 2018 conference in March, also hosted by Ontario Genomics. Featuring a panel of professors and postdocs from four different Ontario universities, the wide-ranging panel discussion is summarized in a companion article (read about it here). 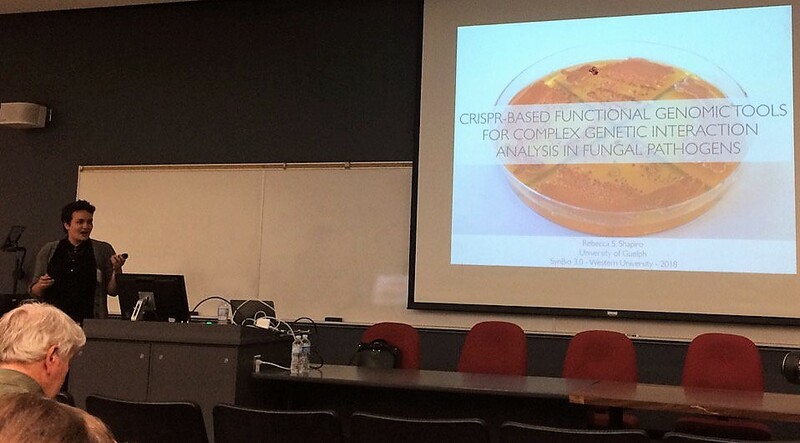 Dr. Rebecca Shapiro (University of Guelph) gave the keynote presentation, and presented her exciting work on developing functional genomic tools to study pathogenic fungi. Shockingly, the number of deaths per year due to fungal infections is equivalent to HIV/AIDS, but the development of new anti-fungal compounds has lagged in recent years. She described her use of CRISPR gene drives to stably engineer these otherwise difficult to study fungal strains, which is a resourceful new tool for understanding these pathogens. Dr. Rebecca Shapiro (University of Guelph) giving the WSB 3.0 keynote presentation, on her work to identify drug targets in pathogenic fungi using synthetic biology tools. Image courtesy of Western SynBio Symposium. Dr. David Edgell gave concluding remarks, expressing his excitement about the growth of synbio in Ontario. He also called for ideas on launching a “grand challenge”, which could be solved through collaborative efforts by researchers in southwestern Ontario. This enthusiasm perfectly summarized the conference, where the growth of local synbio research programs is leading to exciting new opportunities for southwestern Ontario and beyond. For more photos, see the Western Synthetic Biology Symposium twitter account.